According to my iPhone it's currently 28C though it apparently feels like 33C, an uncomfortable temperature at the best of times. I'm sitting, sweating away, with a permanent bottle of water as a faithful companion. Last week saw temperature in the mid-30s through the entire week and even night time temperatures steadfastly refused to drop below 26C. For someone who grew-up believing 15C represented a fairly hot summer's day, this is uncomfortable to say the least. Over 10,000 people across the country were hospitalised with heatstroke last week alone. 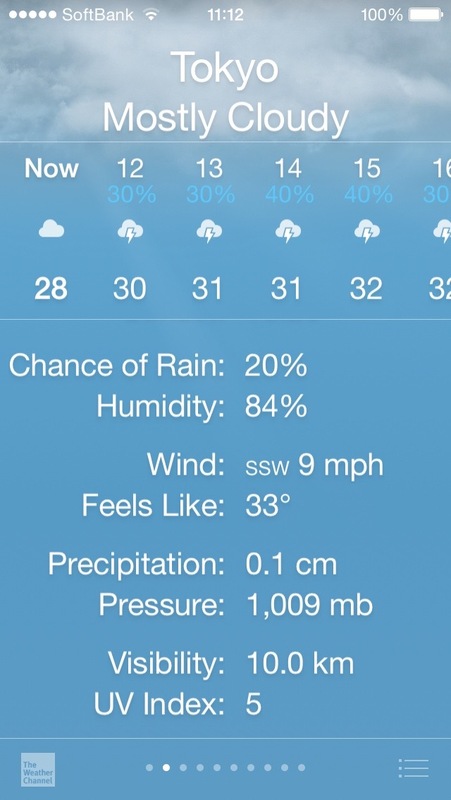 But it's not the heat that really causes the problem, it's the humidity. 84% half an hour ago, it's risen to 89% as I type and will undoubtedly continue to rise through the day. Yesterday it hit 98% and stepping outside is an instant exercise in saturation, your clothes drenched in sweat that simply refuses to evaporate despite the temperature. 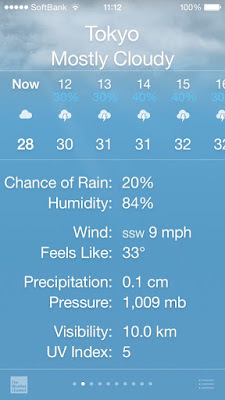 And that's the problem with the high humidity. The heat makes you sweat but the humidity prevents it from evaporating and without that it doesn't act as the body's natural cooling system. And you just get hotter and hotter until you collapse and are carried off to hospital. So whatever you do if, like myself, you're unaccustomed to this debilitating weather, keep that faithful bottle of water with you wherever you go. And find a department store. They're mercifully air-conditioned.